What does a year of new adventures look like? And how might those adventures change throughout the months and seasons in a calendar year? With our 12 Months of Adventure content series, we'll be diving into exactly that. For each month throughout 2019, we'll be highlighting a different outdoor activity/focus and inviting you to follow along and take on a new adventure (or 12). Tapping the expertise of our knowledgeable Contributors, we'll be providing educational resources, how-to tips, and trip ideas and excursions—so you can get out and start racking up adventure time, pronto. 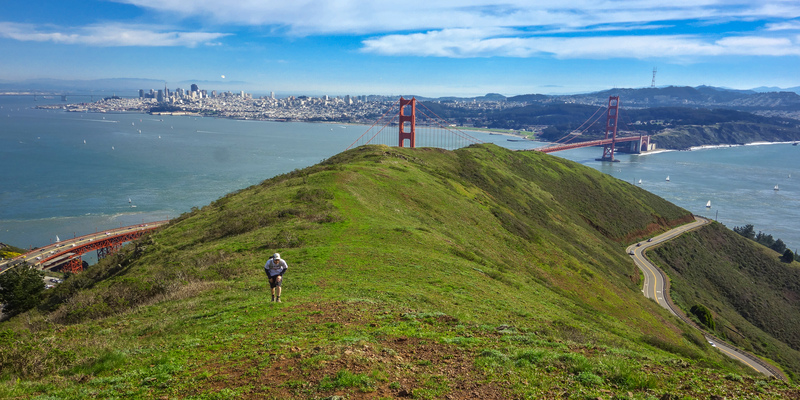 Trail-run training in the Marin Headlands. Rini Sugianto. The outdoors are the world’s biggest playground. We use them to unplug, be present in our bodies and with others—why not also use them to face our fears and overcome our mental and physical obstacles? At Outdoor Project, we created the #12MonthsofAdventure to inspire your outdoor adventures, and during the month of February we turn our attention to fitness. Think, perhaps, of the goals you set in January. Think again about what you’d like to change or improve. And remember that outdoor adventure is the ideal context to achieve it. Now that January is behind us, the frenzy of New Years resolutions is over and we face the hard reality that fitness is a challenge, and finding the motivation to keep trying can be even harder. Enter the adventure mindset. If you’re here, you probably understand the value the outdoors plays in fitness because you are already connected to it - be it the direct fitness benefit you gain from engaging in an outdoor activity or the motivation you get to train by focusing in on completing a specific outdoor objective. That connection is worth ten times its weight in iron. The change you make to be healthier, live longer, and improve your mood and energy is already challenging enough to do it in ways that you don’t enjoy. If it’s going to be hard, in other words, it better be worth it. Outdoor adventure has a physical challenge built in. Sometimes, in order to climb mountains, we must literally climb mountains. Other times, we use the gym. Whatever you decide, we have options for both. Remember to use conservative decision making as it relates to backcountry travel and avalanche hazards, and always remember to practice Leave No Trace when out enjoying the splendors of our beautiful landscapes. We hope you get inspired by 12 Months of Adventure and are able to take on some new adventures this year. Don't forget to let us know about your snowventures by tagging your photos #12MonthsofAdventure on Instagram and by adding a comment/photos in the comments section below. Happy trails!